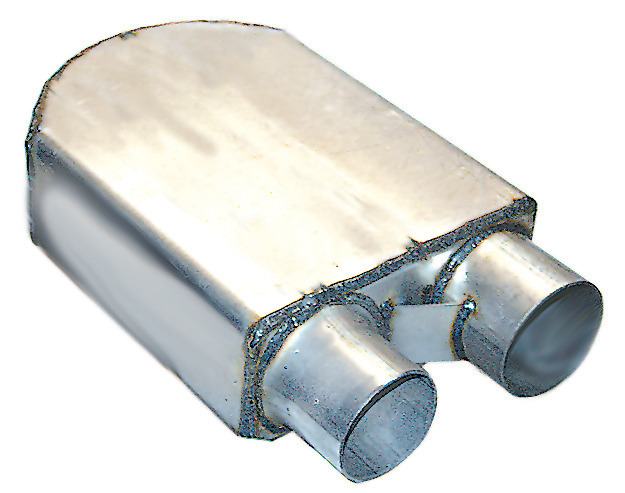 THIS IS IT, a true 90 DB @ 100 ft Muffler just for Sprint Cars or Midgets. The unique design hooks up to your Collector in the normal fashion but the exit is out the front (and can be redirected with a turnout found in this Exhaust section). By designing the Muffler this way the Internal Chambers can be larger so as not to rob valuable Horsepower. The rounded flow through back spins the exhaust gases to lower the DB readings to 90 or less. You can rotate the Muffler to clear the Side Knerfs and you can also put a turn down on the exit for further noise reduction. This Muffler was tested at California’s toughest noise restriction race tracks and passed them all. If You Have A Problem Being Loud, Here’s Your Answer Without Killing Your Power. CRA / USAC Legal!!! !